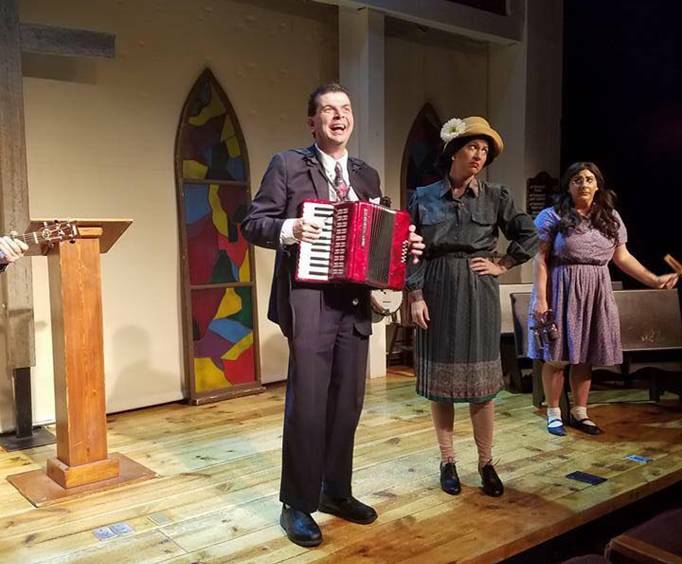 Join in as a member of the Mount Pleasant Church's 1938 congregation as part of this interactive musical comedy that will feature music, comedy - and you! This musical comedy will take you back to the year 1938. The audience plays the part of the Mount Pleasant Church's congregation, and you are attending the church's first Saturday Night Sing. You'll be treated to gospel songs, such as 'I'll Fly Away' and 'Church in the Wildwood' along with the comedic antics of the actors who portray the black sheep in each of our families. If you want something out of the ordinary, this show is exactly what you've been looking for . Absolutely loved your production and each character was portrayed as if i knew that person. Thank you for your hard work and extra practices along the way to make the show a delight and thought provoking about what am i like in my church surroundings. Would love to have you here in orange county, california. Let me know if you ever come this way. Saw this in 2001 and 2003 and enjoyed both times. Quite a fun and friendly show! Well worth every penny....Funny and descent.